For operation, cleaned and pool maintenance using a range of engineeringtech systems. 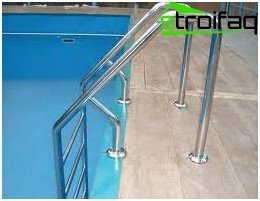 Even at the design stage is selected all the necessary equipment for swimming pools, thought out and calculated its location and installation. 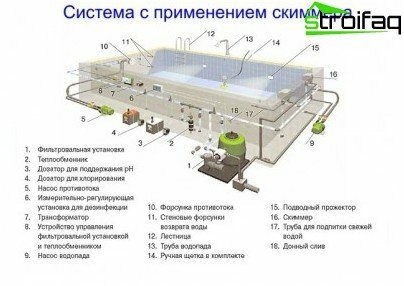 Depending on the functions performed by the equipment is divided into several groups. Some elements are engaged in pumping and water supply, others - its heating and disinfection, and others are for the convenience of using the pool. 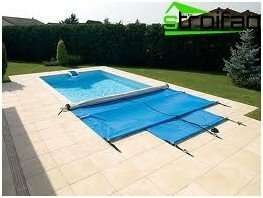 Equipment for swimming pools can be divided into primary and secondary based on the importance of its purpose. Equipment for the frame pools not muchdifferent from a landline. To frame the pool also need filters, pumps, disinfecting apparatus. Only it consists of a metal frame covered with PVC film and is most commonly used in the country or in a country house in the summer season. Pool equipment scheme clearly shows the location of all the below listed and described elements. Basic equipment is intended to provide basic pool functions. It is responsible for filling the bowl with water, its circulation, filtration, disinfection and plums. 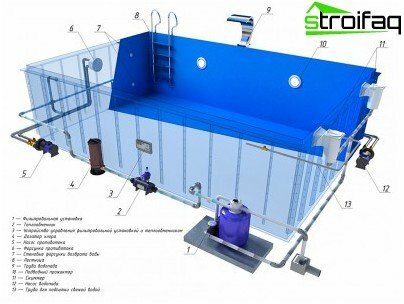 The filter unit is needed in the pool,so that the water remains clean and transparent with a blue tinge. If you do not use it, the standing water becomes turbid with time, will "bloom" as indoor pond or swamp, and microorganisms will multiply uncontrollably and freely. 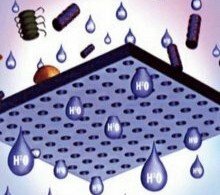 The filter cleans the water station from dust, dirt, leaves, and all microorganisms that may attack the open outdoor pool. 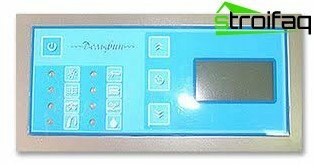 In addition, it monitors the performance of acid-alkaline balance of water and iron levels. Deviation from the norm this index may harm human skin or the parts and components of the pool. 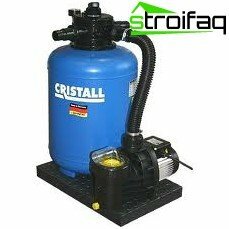 If the pool has a small size, itwater filtration should be carried out continuously. The large pool filtering can be performed 1 time per day. 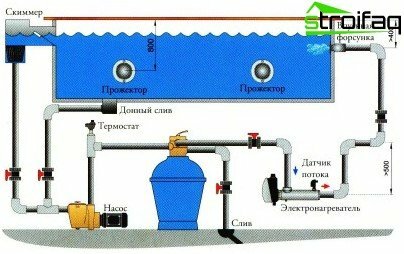 Power filtration system and the number of pumps is calculated from the volume of water. 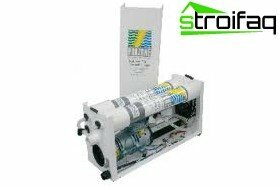 The filter unit comprises a pump for circulating water and filter capacity. 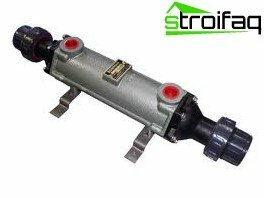 Depending on the cleaning element filters are classified into single-layer, multi-layer and cartridge. single-bed ion exchanger are of the filter chamberpolyester, reinforced with fiberglass, which is quartz sand. 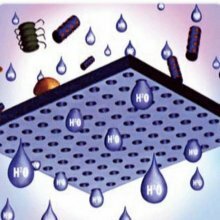 Sand filtration purifies water from small elements and is very easy to maintain. Multilayer filters purified by hudro-anthracites and sand of various fractions. 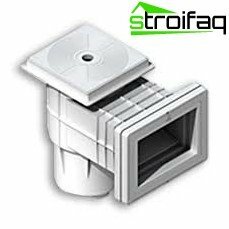 To get rid of turbidity, foreign tastes and odors, as well as water-insoluble particles. Cartridge filter systems differentfiller: granular or briquetted coal, polypropylene fiber and other fillers. You can pick up the cartridge with the individual composition of the preparation and changes in water quality. Moreover, the elements of such systems is easily replaced. For the comfort and convenience of the water in the swimming pool for adults should have a temperature of 25-26 ° C, and in the children's pool - 30 ° C.
heat exchanger connected to the heating system at home. It consists of a coil with the inside of the flask, wherein the coolant runs. Water washes the outside of the coil and is heated. The power of the heat exchanger is selected depending on the volume of water. Maximum power is needed only at the beginning of heating, when the pool is filled with cold water. The heat exchanger is connected after the pump and filtering station, but before the chlorination system. 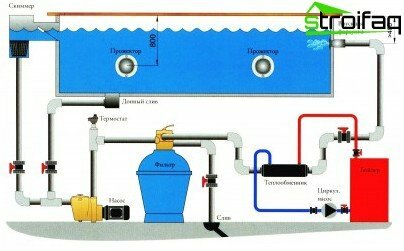 If the water is too chlorinated or sea, the use of titanium heat exchangers. The advantage of using heat exchangers is the possibility of heating a large volume of water and the savings on electricity, heating if the house is arranged on gaseous fuel. flow heaters used for heating a continuous streamwater and installed in small spaces. 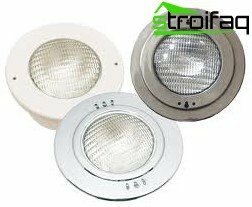 The body of the instrument is made from plastic, titanium or stainless steel, and the heater - of a special stainless steel alloy. 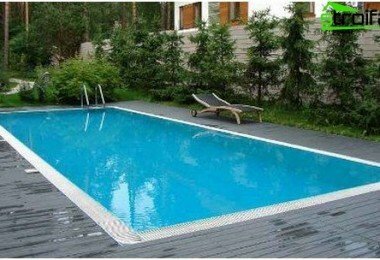 The power of the electric heater is selected depending on the volume of the pool and can range from 3 to 18kW. The relay of protection against overheating, pressure sensor, flow sensor and the thermostat has supplied an electric heater, and it is a huge advantage. 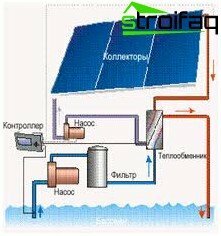 Solar collectors heat water using solar energy. They are composed of modules, each of which can heat the water to 30 m3. Installation of collectors is very simple and requires no special knowledge. 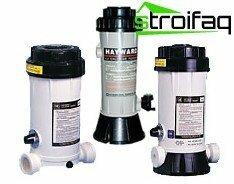 To maintain a constant water circulationfilter system pump is used. 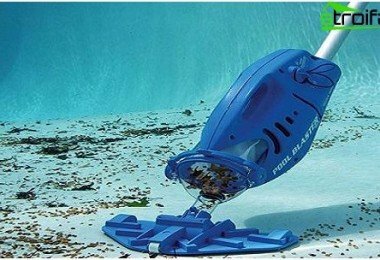 Picked it depends on many factors: the volume of the pool and its purpose, such as filtration systems, water supply distance and many others. 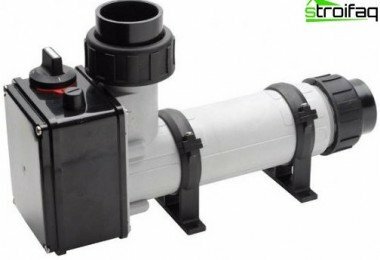 There are self-priming pumps,being above the water level, can raise it up, and pumps with normal suction. Some pumps have a pre-filter, in others - it is not. 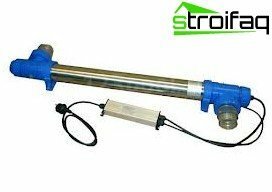 Pumps with pre-filter used in filter systems, pumps and without it - for rides, waterfalls and whirlpool. For priming the pump must be to choose the correct diameter of the pipeline and ensure unhindered absorption of water. gradually include pumps for attractions, waterfalls, air massage, geysers, etc. bottom. Management dashboards manually programmed for a specific mode. chlorine Dispensers the most common variant of water disinfection. 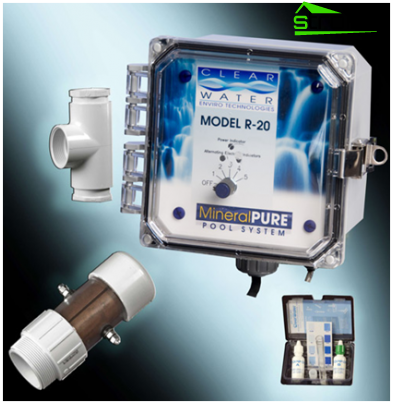 It is mounted in the pool system and independently controls the level of chlorine in the water. Using the handle, you can adjust the dosage regime. Ionizers purified water ions of copper and silver. This reduces the need for chlorine. Ozonizers for cleaning and disinfection of water have begun to use relatively recently. But this method has gained popularity as the water after Ozonator clean and very beautiful. Ultraviolet setting - A relatively new method of disinfection. Viruses, fungi, algae and single-celled die under the action of ultraviolet light. For connecting the basic elements of the basin andto ensure their work is needed pipes, nozzles and plums. They can be made of plastic or stainless steel. Plastic - cheaper, and stainless steel - durable. Skimmers needed for the abstraction of water from the surface of the pool and the filtration of dust and dirt. Additional equipment is necessary to ensure convenience and comfort in the use of the pool. It's all sorts of devices for entry to the swimming pool, its sheltering for the winter, the air control characteristics of the room and others. The function of stairs and handrails obvious. Most often they are made of polished stainless steel. In the deep basins of the ladder are attached at the top and the lower part is screwed to the wall. Stairs provide safe descent into the bowl basin and rise out of it. 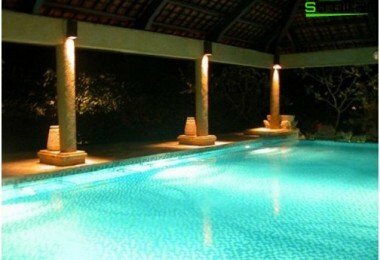 Swimming pool lighting It is necessary not only for appearance. It allows you to use the pool in the street at night. Floodlights and luminaires are mounted in the wall of the bowl. Pools harbor at night, winter or just when leaving for a long time that did not get dirt in it, leaves and more. In addition, from the indoor pool decreases water evaporation. 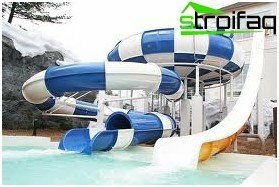 Equipping a pool for children or just a fun pastime, you can use a variety of attractions: slides, geysers, waterfalls and more. Dehumidifiers and air ionizers are used to change the humidity level in the room, which is equipped with a swimming pool. The air dried for added convenience. Installation can be carried out only on advanceprepared project. It is necessary to collect the equipment, check all screwed and glued joints, muff, air valves, and others. Fill the pool with water and insert the filter system in the "Washing" mode, and then switch the mode on the "Filtering". 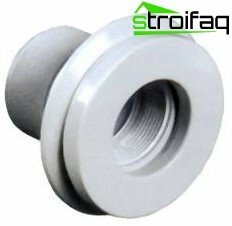 If the leak is not visible, it means that the installation was successful. Installation of equipment in a stationary pool is best left to professionals, and to afford mounting frame pools to cope on their own.